john4jack (Corvallis, Oregon, United States) on 2 March 2009 in Plant & Nature and Portfolio. The twigs were tiny and the light was low, which didn't make for the easiest macro work. For this particular photograph, I used PSCS4's new "Focus Blending." You take several shots, bringing different parts of the image into focus in each shot. Then PSCS4 automatically selects only the parts of each shot that are most in focus, and blends the shots into one sharp image. If there is part of the image that is not sharp, that is because you did not have that part sharp in any of your shots. It's not perfect, but it is amazing! This is so incredible...nature is just so beautiful in the most varied of ways:-) Gorgeous colours!!! You did a great job on this one too. These colors are so alive. Such beauty in nature. What will those clever folks at Photoshop think of next? Whatever it is, I'm sure you'll put it to expert use as you have in this photo. The details and colors are wonderful. Un branchage étrange et coloré! I love the texture magnifique! Image! Superbe! Wow...I'm impressed. Fascinating looking plant. Marvelous composition. Colours are fantastic ! Excellent. A great capture of a very cool element of nature. The lens seems very interesting. Great textures and patterns for who loves macro photography. Colors are simply gorgeous. I love it, well done it's beautiful! Love the high contrasted colours and their harmony between the suject and the background. lovely macro Jack !! Love the colors john4jack. The Focus blending tool you mentioned sounds very interesting! Great process. I'm jealous, only hace CS2. @Lee: And, as you know, you can't do this with CS2; I'm sorry. The blending works amazingly well. A fine image to begin with but the processing, no doubt, contributed heavily to the outcome. Nice photographic and technical work. I think the lighting has come out to be perfect. And the macro is also very impressive. Of course, I see some hard work there. @Monique: It's a piece of cake. With the macro, we can admire the smallest details of the nature. Amazing shot. The colors are fantastic. And thanks for sharing the Blending method with us. I did not know about this and am happy I am learning so much here. Thanks very much, Jack. Wow, like a beautiful and colorful bouqet. Very impressive how this program works with just the focused parts of the image. The warmth of color is my favorite. Well done. Wow! The colors are warm and rich and I love the focusing technique - I hadn't heard of that one before. Thanks for the info! @willow: Important! You need to run "Auto-Align" before you run "Auto-Blend." That often is not mentioned. My first attempt looked like a disaster. So I called Adobe Tech Support; they clued me in. An excellent close-up, doesn't get any better than this! The sharpness of the foreground over the superb bokeh of the background, bravo! @vu@granby - Wolfgang: Absolutely could not have done it without "Auto-Blend." @EYES WIDE SHUT: Thanks, Paul! Wow! That is totally beautiful. Thanks for that note about CS4; I guess I better upgrade. wow, that is incredibly sharp and beautiful Jack. What a great technique. (I'm going to work at catching up later today -- busy, busy, busy). Interesting efect and explanation. Thanks for it. I love this! Perfect! Especially the colors! Stunning Jack....They are so very colorful! Thanks for sharing. Oh my, ... amazing details and colours here! Super macro! Congrats! @Robert Kruh: Thanks, Robert. We need you to join aminus3!! @jamesy: Anyone who sends me their email address, I will send you the original files that were Auto-Blended. You will be amazed at what the software can do. Oooh... I love lichen! It's so pretty, all the different colors. I've found it very hard to photograph well, though. This is perfect! I've never seen it on a twig like this. You've captured it very well! This is an excellent image of Oregon in the winter! Beautiful colors. The focus blending is amazing. geez, i just got cs3, and now you've made me want cs4!!!! this shot is amazing...you did a phenomenal job!!! i wonder if cs3 does that also? if you know it does, shoot me those shots at iliv4bears [AT] aol [DOT] com, so i can try it out!! and thanks much for that offer!!! Impressive. What a fascinating subject. Focus blending sounds interesting. @Laurie: It is interesting, Laurie; and it's also a piece of cake. Ooooohhh!!! It comes with CS4? I know there are some specialty programs out for this but didn't realize it came with CS4 ... I like... I like very much!!! Excellent image, Jack! 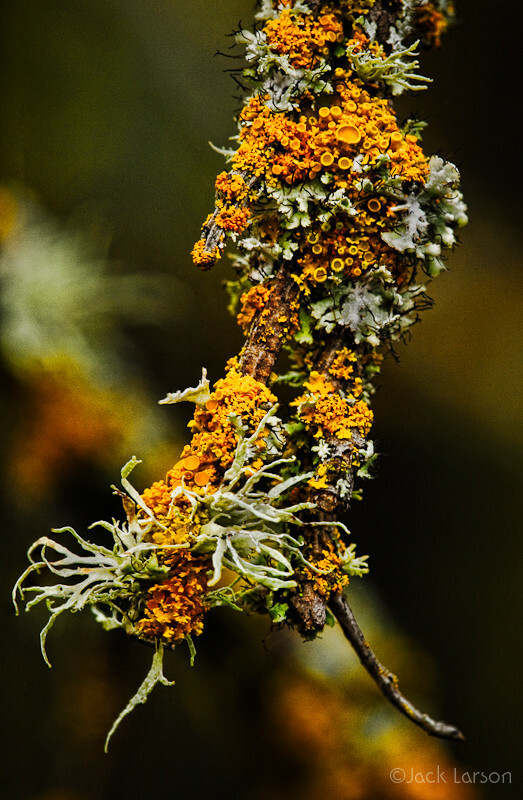 Stunning colours in that lichen. What a beautiful shot. Great details, colors and light. Perfect processing. Focus blending... wow! It looks incredible! cette image est tellement réussie, John, les couleurs, la netteté, ce n'est pas CS4 qui fait tout le travail, vous ne me le ferez pas croire !! en tout bravo. @Alivia: Oh oui, il est CS4. Plus un peu d'ajustement de courbes. That is so cool, Jack! And I love your tip about the blending. I have CS4 and didn't know about it - now I'm going to have to play. Wonderful detail and stunning bokeh...great! Beautiful details of that lichen. Well done.